If you enjoyed checking out the master bathroom in this home, then I know you’re going to love the kitchen too! This gorgeous space, with its white, glazed cabinets was created using a black, white and gray palette – inspired by a variety of marbles that were used throughout the home. And in a world that is well-infused with Calcutta marble, I’m excited to share with you our very own Vancouver Island Marble! The raised bar top hides some of the cooking prep from the open layout dining room/living room and provides extra seating for guests. The dark cherry toned island grounds the kitchen and flows perfectly with the porcelain tile floor. Now personally, I might not have done white grout, but I have kids and dogs so I need to maintain SOME form of sanity. This photo gives you a good idea of how the U-shape of the kitchen relates to the island in the middle. We chose a black granite for the perimeter countertops as it’s easier to maintain and grounded the space nicely by tying into the dark tile flooring. To the right of the island is the sink, which has windows overlooking the same view of Pipers Lagoon as the window in the ensuite bathroom. The kitchen is in full view from the dining room (which is also open to the living room). 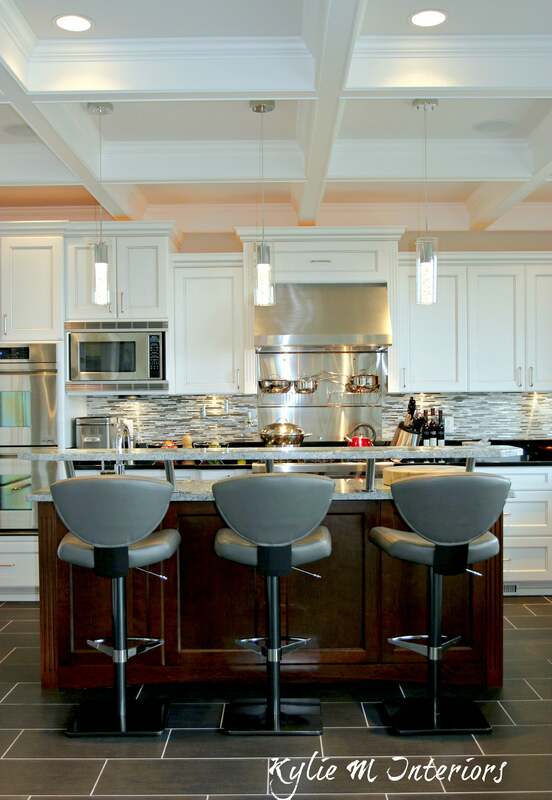 The coffered ceilings are at 10′ in the kitchen and rise up to 12′ in the dining area. Want some custom-ideas for your kitchen? Kylie M Interiors Interior Decorating and Design Ideas Online Consulting and E-Design Services Based in Nanaimo Vancouver Island, serving the whole darned world! Where can I find the pendant lights over the kitchen island? Thank you! Hi Susan, those were surprisingly a Costco find! I loooove those glass pendants with the bubbles. Where did you get them?